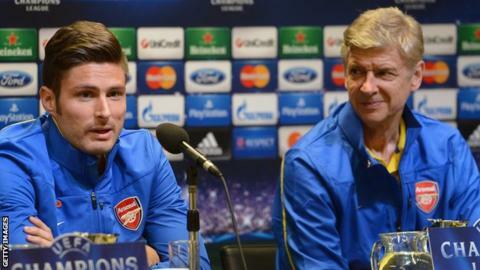 Arsenal striker Olivier Giroud says Arsene Wenger is the only man who can solve the club's current problems. The Gunners are currently 13 points behind Premier League leaders Chelsea and Wenger was verbally abused by Arsenal fans following his side's 3-2 loss at Stoke on Saturday. But Giroud said: "There is no other coach who knows Arsenal better than him. "I am in no doubt he is the man to solve this situation." Arsenal advanced to the Champions League knock-out stages for the 15th consecutive year after beating Galatasaray 4-1 on Tuesday, but the team's patchy league form has led some to call for Wenger to step down. Giroud said he sympathised with fans' frustrations, but believes his fellow Frenchman is not to blame for Arsenal's struggles. "I understand the fans because when you are a team like Arsenal, the fans want you to win every single game," Giroud said. "It is not the manager. He is a great manager. "Just because we lost at Stoke in an away game does not mean the season is finished or that everything is over." And the striker insisted that Arsenal could still overhaul Chelsea's lead at the top of the table. "Chelsea will not win every game," Giroud said. "We are going to take games one by one and focus on ourselves. "We just need some momentum, some more wins and to get our confidence back." Read more on Arsene Wenger: Arsenal fans right to complain, or greedy?